Hugpong ng Pagbabago (HNP) Chairperson and Davao City Mayor Sara Duterte-Carpio said the installment of the next Speaker of the House of Representatives is not her call to make. Duterte-Carpio made the statement following reports about her alleged endorsements of some Congressional bets as the next House Speaker. During the Visayas leg of Hugpong’s campaign rally, she introduced former Leyte Representative Martin Romualdez as “the next Speaker of the House” in Tacloban City on March 20, and Marinduque Representative Lord Allan Velasco during their campaign stop in Tagbilaran, Bohol on March 21. Romualdez is running for Leyte first district Representative in the coming May Midterm polls. He is a nephew of former first lady Imelda Marcos and a known ally of incumbent House Speaker Gloria Arroyo. Velasco, meanwhile, is the son of former Supreme Court Associate Justice Presbitero Velasco, Jr. The Presidential daughter later clarified that the HNP was only supporting Romualdez’s and Velasco’s bids for the influential post like how they support former Foreign Affairs Secretary Alan Peter Cayetano who is also gunning for the House Speakership. “Walay choice of one but ang ginatan-aw namu kung kinsa ang supporter ni President Duterte because we need the House of Representatives to move towards the direction of the President,” the lady Mayor said at the sidelines of Hugpong’s campaign rally in Cebu on March 22. When pressed if she sees term-sharing as a possible compromise between the contenders for Speakership, Duterte-Carpio said it is not her call to make. “It’s for the congressmen to decide,” she said. The Presidential daughter earlier said it is too early to talk about the Speakership because the elections have yet to take place. 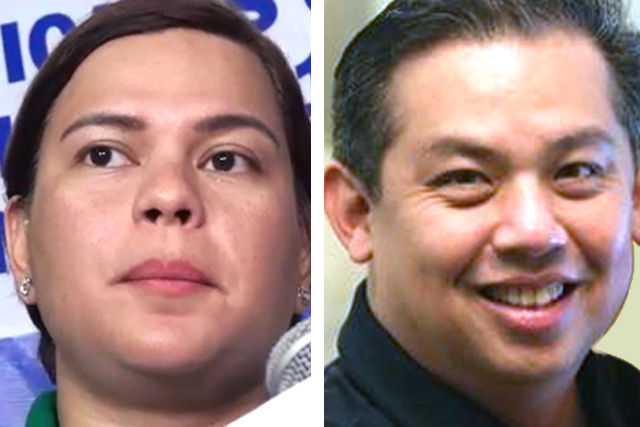 MANILA, Philippines — Hugpong ng Pagbabago (HNP) chairperson and Davao City Mayor Sara Duterte-Carpio has clarified her endorsement of former Congressman Ferdinand Martin Romualdez as the next Speaker of the House of Representatives. Duterte-Carpio on Tuesday (March 19) surprised many when she introduced Romualdez as the next House Speaker on stage at a campaign sortie in Tacloban City, Leyte. Romualdez is running for Leyte first district representative in the coming May midterm polls. He is the nephew of former first lady Imelda Marcos. But the lady mayor later clarified that the HNP was only supporting Romualdez’s bid for the influential post like how they support Marinduque Rep. Lord Allan Velasco and former Foreign Affairs Secretary Alan Peter Cayetano, who are both gunning for the House Speakership. Duterte-Carpio added, it is too early to talk about the Speakership because the elections have yet to take place. “The best time to talk about that is after the elections,” she stressed. The Presidential daughter, however, reiterated her stand against the return of Davao del Norte Rep. Pantaleon Alvarez to the post. Alvarez belongs to Partido Demokratiko Pilipino-Laban ng Bayan (PDP-Laban), the political party headed by the Mayor’s father, President Rodrigo Duterte. Senatorial bets for the May 2019 midterm elections continue to hold campaign sorties in a bid to persuade the public to cast votes in their favor. 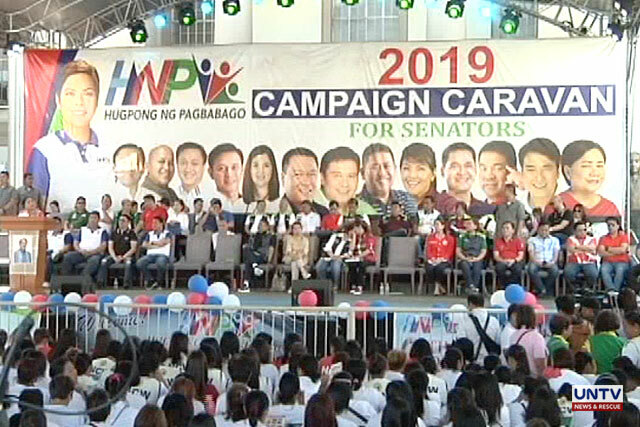 On Tuesday, March 5, candidates of the administration-backed Hugpong ng Pagbabago party visited Antipolo City and Bacoor City, Cavite. 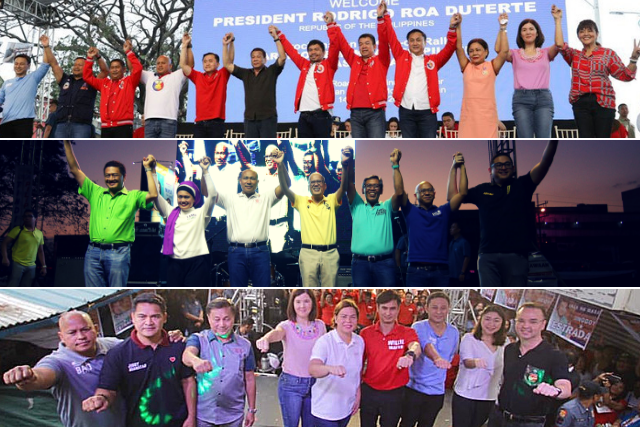 Hugpong bets Francis Tolentino, Sonny Angara, JV Ejercito, Jinggoy Estrada, Cynthia Villar, Ilocos Norte Governor Imee Marcos, former Senator Ramon Revilla Jr. and former Police Chief Ronald ‘Bato’ dela Rosa joined the political rally. The Senatorial bets of the Partido Demokratiko Pilipino-Lakas ng Bayan (PDP-Laban), on the other hand, traveled to Bangued, Abra to hold a campaign rally with President Rodrigo Duterte on Tuesday. The Opposition slate ‘Otso Diretso’, meanwhile, went to Muntinlupa City to woo voters in a town hall meeting. Those who joined the campaign sortie were senatorial aspirants Erin Tañada, Atty. Romulo Macalintal, Samira Gutoc and former Solicitor General Florin Hilbay. Senator Bam Aquino, Atty. Chel Diokno and Magdalo Party-list Representative Gary Alejano were not in attendance but sent their respective representatives instead.